Chuffed my painting is featured. How good is that! When the Plein Air Art Prize invitation as a finalist arrived and my painting is the one used on the invitation you get to feel chuffed. 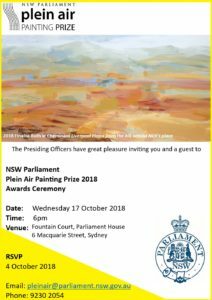 I received an email with an invitation to the awards ceremony for the NSW Parliament Plein Air Prize and an image of my entry is being used to promote the exhibition. I am honoured. Thank you. I am feeling chuffed. 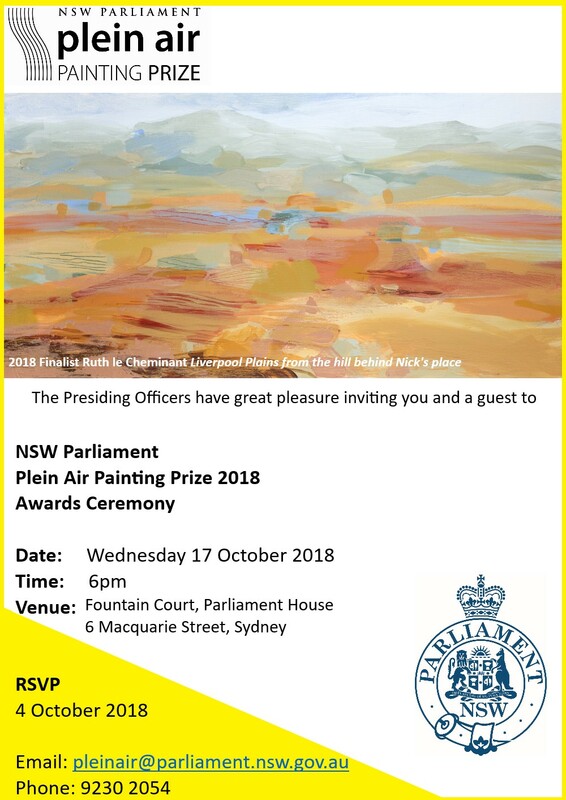 The image of my painting ‘Liverpool Plains from the Hill Behind Nick’s Place’ is being used as the identity of the Plein Air Prize for 2018 for print, outdoor and digital promotion. They are using the image in a variety of ways. The banners have a segment of the image and are up outside Parliament so when you visit the exhibition – on till Friday 19 October – at Parliament of NSW, Macquarie Street, Sydney Monday to Friday only, you will see them.